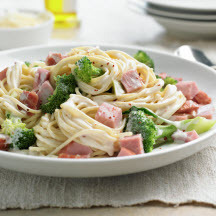 CooksRecipes has quality, kitchen-tested recipes for a variety of ham dishes made with pasta, including noodles and macaroni, that you can count on for successful deliciousness. Leftover ham doesn't always mean sandwiches. With purchased Alfredo sauce and frozen broccoli florets, this pasta entrée comes together quickly. This casserole can be prepared the day before serving. 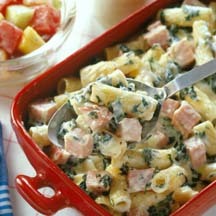 Serve with fruit salad with poppyseed dressing. 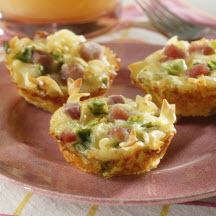 Let the kids help with these tarts—they feature favorite flavors of ham and cheese, and are kid-sized too..